since the massacre last May. in a special oererntWry fo"*1rfe Israeli Honorary Consul General Dr.
Frank Mayer. Leading Luxembourg officials attended. to advance the cause of peace,"
and said that for Israel U.S.
ham Salter and Gerald Siegel. Allen Gordon. Jules Gordon. I. A. Durbin, Nathan Pritcher, Mrs.
president. At the same time Mr.
Rally and many other activities. age on the prospect of peace"
places than with oily places "
lution or abstained than vote! , way thnt w can a'Jequatels. L*a-i'-'-l' CoancQ ha been most! exceptional servie* to this com-'. program that of our Women's! hoped for an acceptance of 20.
lMlllllfl.1 with both our loca. ha- e b*y-n don* on an extrerr. And to '. .' fSWtlea J.
we. fo- the first time were invited . 306 E. HALLANDALE BEACH BLVD. 10 pm to 1 a.m.
We cater to All Diets 'op* "*"
g.1. !-* Phone: 981-9192 Also lour offices in Dade County to serve you. the members of the daily Minyan. Elias Wolfe and Max Yamner. raham Koster chanted the liturgy. speaker was Mrs. Abraham L.
Brandeis UnivCT<y. Dr. and Mrs.
came president of the university. prison reforms and civil liberties. resolution on a local level. made by calling the temple. time during their winter vacation. .AccocJ-Cm Poaugc Paed at Man FW. S:-er V -. Di Sonus Atk-a. Whiie Conservative rabbis are sail not "recognized"
bmpmak a mature approach lo c real need. of rizz.i cry :.-: BOM avffl be done in the future. defense agency considers the 'Jewish Quotient." Jews for equality in Europe and this country. of even more serious consideration in our changing society. eis-uut." It was accurate, too. dkrulous: indeed it is ridiculous. should occur had been a topic. aspects af this series of talks. Chines*- psffci is ehiefh infXj. H eeacaU htrd-ridtr on economic decision whe-. to effect a Etml *r sense of order in economic dectsio-making. rknt Nixon's persorne. *hiftmg in his eovernment reorgimaation. How well did he do in the choice of Kissinger-type herJ-riders? to the task in the crucial top jobs of his Administration? right product If hue* eesagl were candy rers or cie^r^t*. of the Common afariu t is quite a move. as a strong troth \\ it. of morale, the sense of participation in something exciting. e damned by all sides when he fails. more talent from outside the government. badfy represented in the Nixon Administration. left its mark. The public relations firm leaves a very special mark. mountain peak to the other. ous way towards the top. death rather than fall into enemy hands. grims before them had by foot. effort and I would continue on. swer left no room for argument "But I've never been there." 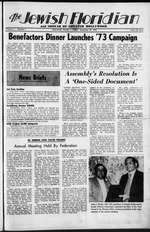 voices heard for supporting the 1973 Federation campaign. tween Stanley BecUerman and Bill Horvitz. Past president Jesse Martin was then- with his wife. Cinda. look) (I well as she sat and talked to her old friend, Abe Mailman. support of Israel and the many local beneficiaries. reunion with his family in Israel. American ORT meeting last week. with an openhar, food and entertainment. And loK more... all standard equipment! the liank is too much to think about. Well! 7 i he firal i oaltlon. pleaae." fh r dance classy in Israel. la ; after the Six-Day War,"
ice to the cultural life of Israel. and wanted desjierately to come." man, presented a "Hi Neighbor"
radio and given many concerts. Top First Class Accommodations, Meals, Many Extras!!! clock dials. Slide in pillow speaker. Sleep switch. Durbin, president of Temple Solel. Durinn her school days. Mrs.
in Jewish youth group activities. For the past three years. Mrs.
two children reside in Hollywood. of the organization from accepting petitions from individuals. * INSURAMCf. I KTISUTIf . Savings counselor for full details. Ben Kaplan. Manager. Hallandale Office. universe. The dist into which the I^ord breathed life to create man. not merely to reduce want but to restore dignity. year Of course, then we fund-raisers would be out of a job. 'Too Provide Guests We Do All The Rest"
OPEN 5 A.M. TO 8 P.M.
Galilee and the Weat Bunk. the evil tongue spread gossip. system. 4. Include welfare reforms. State of New York, to name a.
not let well enough aljne? him for the next four years. er, and the reaction of the Israelis. tion and a country of their own. the serves as the sole professional. ice to the Community five times. at 4200 Bicayne Blvd., Miami. become Bat Mitzvah at 11 a.m.
spiritual leader at the temple. Robin Debra, daughter of Mr.
Mark, the son of Mr. and Mrs.
Jeffrey, the son of Mr. and Mrs.
Cynthia, the daughter of Mr.
Dec. 29. at Temple Beth Shalom. Evan, the son of Mr. and Mrs.
David, the sen of Dr. and Mrs.
ing, Dec. 30, at Temple Beth El. Scott, the son of Dr. and Mrs.
ning, Dec. 29. at Temple Sinai. Bat Mitzvah Friday evening, Jan.
man Atkin, (right) newly elected president. lem.'' Dec. 30; "White Zombi." Jan. 2; "I-ost Horizon" Jan. 4.
and "Fu Manchu," Jan. 7. Dr. and Mrs. Joseph Hopen. HOLLIS. L I 188-11 HILLSIDE AVE.
MIAMI. FLA 13385 W. DIXIE HWY. 11385 W. DIXIE HWY.. MM. Youth Council Film Festival "The Phantom of the 0|>cra"
Hifih School Students Showing 7:30 p.m.
College Students Showing 9:30 p.m.
eral Building Young Circle 1 p.m. Youth Council Film Festival "The Gaucho"
High School Students Showing 7:30 p.m.
Party Miramar Community Center 11:30 a.m.
eral Bank Bldg. Hallandale 12:30 p.m.
Meeting Home Federal Bldg. Hallandale 8 p.m. Youth Council FUm Festival "The Thief of Bagdad"
High Sch(H)l Students Showing 7:30 p.m.
College Students Shewing 9:30 p.m. Youth Council Film Festival "The Golem"
Men- Curb Sinai Party Temple Sinai 8:30 p.m.
Sisterhood Temple Sinai General Meeting 8 pjn. Men's Club Temple Sinai 8 p.m. Youth Council Film Festival White Zombi"
Young Leaders Ooundl "Issues Facing Jews"
Miramar Community Center 12.30 p.m.
tive1725 Monroe Street. After Nov.
ton Malavsky, Cantor Irving Gold. ages of 14 to 18. The UJA also re-elected Mrs.
tions. Michael Pelavin of Flint. Branch Offiea 7991 Johnson St.
ALL WORK DONE WITH "A GUTEN TAAM"
ami Beach, it has been announced. Morris J. Friedman. Max Goldhoff. man Forvin, Max Shaer and Dr.
llntalUMltfUa Siekne.. Accident Life Annuiti..
Meshe Dayan from Ben Shemen to! via B0AC February S to 19. Only! Weekdays 927-1761 3000 Hallandale Beach Blvd. 615 E. Hallandale Beach Blvd. "BETTER SHOES FOR A BETTER PRICE"
itnt pull chains. 37"j in. high, control. 38'/2 in. high. a Stiffel Lamp all combined. Vinyl. 3-way light. 55'/j in. high. Vinyl. 3-way light. 37'/2 in. high. Open Delly 9:30 to 530, Men. A Fri. Until 9 P.M.
OPEN SUNDAY 1 to P.M.
base switch. 37 in. high. cent Vinyl. 3-way light. 34 Vx in. finished in antique oW bronie. 3-way lighting. 40 in. high.